Hang cabinets yourself with America’s #1 greatest cabinet jack. With the Stand-In cabinet jack you can hold your cabinets up safely, and accurately! Fast, Easy, Safe! Order a FULL SET Today! Scott here, one of the guys I work with, was just looking at/asking about my Stand-In jacks. Claims he is going to buy some. He likes how it looks like I am not working hard, yet installing multiple kitchens a day. More than 500 kitchens installed, using your Jack’s. I was introduced to, and was able to use your product in the field, and was very impressed by its simplicity and complete functionality. I’ve been in the trade for 25 years and don’t find many innovations that change the way I do things… but I’m already rethinking my process having used them. Thank you for the speedy response and look forward to using my own set. I’ll be spreading the word! Please join us in supporting the Ronald McDonald House Charities! The Stand-In cabinet jack, America’s number #1 cabinet jack! Do you have difficulty finding help for your cabinet installs? Would you like to earn more for your kitchen cabinet installs? Would you like to have the ability to install kitchen cabinets by yourself faster than 2 people can? Do you want a tool that will keep your hands free? A tool that will make installing kitchen cabinets faster, safer, easier and more profitable? Relax, you have found it, now you can install kitchen cabinets the easy way and double your production by using The Stand-In cabinet jack! It’s not your fault you feel the sys tem is stacked against you. With builders, homeowners and cabinet salespeople always wanting to get things done for less, cabinet manufacturers constantly increasing their pricing. You are the one that gets squeezed. The odds are against you, but now you have found a way to level the playing field. We know that after you use The Stand-In cabinet jack you will agree that it is a bargain at $199.99 + shipping for a set of 2. The Stand-In cabinet jack will pay for itself on the first job! If you agree tell your friends if not tell me and I will make it right. The Stand-In cabinet jack is the perfect tool for installing kitchen cabinets. The Stand-In cabinet jack is adjustable from 54″ to 72″ with 3″ increments to work with all kitchen cabinets, and is used by many cabinet installers across America and Canada, as well as around the world. The reviews have been fantastic! The Stand-In cabinet jacks can give you the advantage by eliminating the need for a helper, which reduces your cost of the installation and allows you to install more cabinets in less time, increasing your profits. The Stand-In is a lightweight and strong cabinet jack that is used at Wellborn Academy, a tradesmen academy that teaches advanced techniques of installing kitchen cabinets for Wellborn Cabinet Inc. 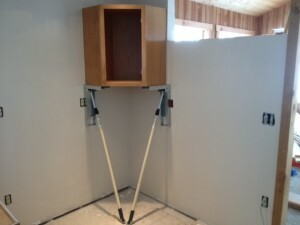 The Stand-In has a strong a stable platform that will hold kitchen cabinets in place so you can install the cabinets by yourself without damage to the walls or leave holes from time-consuming cleats that you have to patch & paint saving you time and money. This is a huge plus when dealing with an exceptionally finicky homeowner or a General Contractor. By using the Stand-In cabinet jack on your cabinet installation bids with tight budgets, you can be more competitive using The Stand-In cabinet jack. Helping you get the jobs you might normally miss. 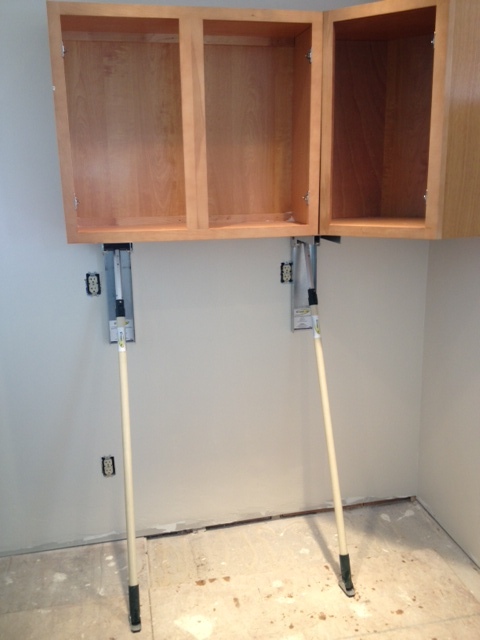 DIY’ers can save 1000’s of dollars just by using the Stand-In cabinet jack for installing their own kitchen cabinets. The Stand-In cabinet jack easily and quickly adjusts level and plumb of a kitchen cabinet with a tap of your foot so you are able to install kitchen cabinets at the precise height. 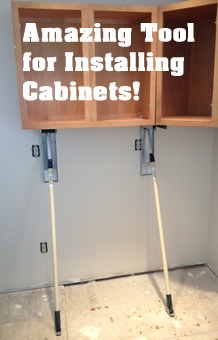 It makes leveling a kitchen cabinet simple, easy and very fast. The Stand-In cabinet jack keeps your hands free so you can do other necessary things and not worry about the cabinet falling to the floor and being damaged. If you would like to know more on how the Stand-In cabinet jack works just watch the video below and we will show you how fast and easy it is to install kitchen cabinets using the Stand-In. And if you are ready to start making more profit on your kitchen cabinet installs we have made ordering easy, just click the secure PayPal order button on any of the pages and we will get you started on a path to making your installs simple and easy with the only cabinet jack that pays for itself! Custom cabinet quality at less than box store price! We are proud to announce that we are now a dealer for Great Northern Cabinetry. We have used these cabinets for years and can tell you that you will not find a better-built cabinet with all the features for such a reasonable price. Because we are a national company we have negotiated the best prices and want to pass the savings along to you. We have the ability to quote cabinetry from your design or we can design it for you, and have them delivered to your job site. just give us a call or drop us an email. The best part of this is for a limited time we are able to offer a FREE set of Stand-In cabinet jacks with any order over $14,000 and we all know that it does not take much to reach that with kitchen cabinets. So hurry while you can get the best pricing on very high-quality cabinets, Drop-shipped to your location anywhere in the USA.